Housing: Adult Hercules beetles spend much of their time burrowing, and should be kept in containers with 3-4 inches of soil, preferably a sphagnum moss soil mixture. Because Hercules beetles are primarily nocturnal, they will spend most of the daylight hours beneath the soil and will come to the surface at night. Multiple female beetles can be kept together in a single container with a single male, but males are aggressive to one another and should be housed separately. Feeding: Adult male and female Dynastes tityus feed on rotten apples, orange slices, overripe bananas, and similar fruits. Orange slices are preferred. Wild-collected adults can live up to three months on this diet. Adults that are raised from larva can live up to a year if raised on this diet. An occasional orange can also be provided. Adults will also feed on “pure” maple syrup that has been diluted by with 1 part water and offered on a wet sponge. This type of feeding should be limited because of the expense of the maple syrup. Also, syrup can allow bacteria to grow quickly in the sponge. When a healthy male and female Hercules beetle are placed together in a container, mating will typically commence quickly and may last for up to 1 hour. After a single mating, the adult female beetle is likely to be gravid (pregnant) and can be separated into an egg-laying chamber. The egg-laying chamber requires special conditions, outlined below. Container: Any large, escape proof plastic or glass container should work as an egg-laying and rearing chamber, provided that there is enough room in the container for at least 1 gallon of soil. Large kitty-litter containers, like the ones pictured above and below right, are a perfect size, and include lids. Plastic, 5-gallon buckets are also ideal. Remember to thoroughly clean any of these containers and use them with caution, especially if they contained cleansers or other chemicals. Ten-gallon aquaria are also a great choice, and are very inexpensive. Small, 1-gallon containers can be used to rear single grubs, but the soil mixture must be changed often. Egg-Laying: The female should be allowed to live in the egg-laying chamber for approximately one month, and then removed. She will lay up to 40 eggs, and these eggs will began to hatch about a month after they have been deposited. Rearing Substrate: The rearing substrate for egg-laying and larvae rearing should contain a mixture of potting soil and rotten wood, at a 2-to-1 soil to wood ratio. The potting soil should be topsoil, and can be purchased from a garden-supply store. It must be free of pesticides, fertilizers, and should include some sand. Many garden-supply stores sell organic humus that contains no pesticides or artificial fertilizers. Rotten wood is also essential for the soil mixture: larvae feed on rotten wood, and female beetles will not lay eggs in soil that does not contain it. As mentioned above, the egg-laying and rearing chamber must contain at least 1 gallon of rearing substrate. More may be necessary in larger containers. Moisture: The rearing substrate used for egg-laying and rearing must be kept moist to the touch. Check the mixture daily, and expect to add water frequently. If the mixture is allowed to become dry, the eggs or grubs will not survive. Notes on Rotten Wood: Wood for egg-laying and rearing chambers must be rotten hardwood. The wood of pines and other conifers contain chemicals which are toxic to the beetles. The best wood will already be in an advanced state of decay, such as exposed logs found on the forest floor. Hard, dry wood, such as firewood, will not be eaten by the beetles until it begins to rot, so it is best to use wood that is already rotten. Most wood collected outdoors will contain mites, ants, centipedes, and other arthropods, many of which will attack Hercules beetle eggs or grubs, and it is important to prepare the wood before it is used to kill these creatures. Mites are a particular problem because they can "balloon" like baby spiders. This allows them to infest containers that have already been decontaminated. 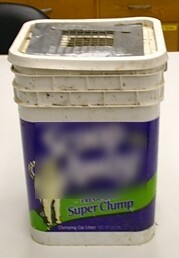 The same kitty-litter containers mentioned above can also be used to soak wood in water before use. The water level should be sufficient to cover the pieces of wood, and the wood should soak for 1 week. After soaking, freeze the wood for 1-2 weeks if possible. Once the wood has been treated in this manner, it should be broken into small pieces and mixed into the soil. Additional Nutrition: The addition of rotten apples to the soil/wood mixture tends to lead to larger grubs adult beetles. 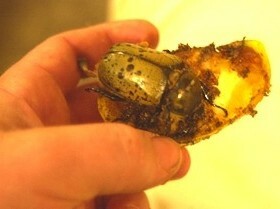 Dry dog food is another supplement, and also leads to larger beetles. However, dog food often leads to mite problems. Chopped, rotten leaves can also be used as a supplement, and can be used occasionally when wood is unavailable. One-gallon ice-cream containers make good pupal chambers. Separation of Grubs: A female will initially lay multiple eggs in a container, and many of these will hatch into tiny grubs. These grubs will then feed and grow in the soil/wood mixture. After about 18 months of feeding, the grubs will enter a "wandering" stage, and they will need to be placed in individual pupal chambers for pupation. 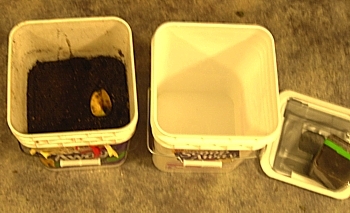 During this stage, the grubs can be placed in smaller containers with just enough soil to make pupal chambers. One-gallon containers half filled with soil are ideal. Emergence: Adult beetles will emerge from their pupal cases a few weeks after pupation, but at this time, their exoskeletons are not fully hardened and the beetles will remain underground for some time. During this period, the beetles are said to be in a "teneral" state and are referred to as teneral adults. Because the adults stay underground, it is not often obvious that they have emerged, and it usually a good idea to look through the soil every few days for an emerged adult. It is important to refrigerate the teneral adults (at apx. 40 degrees F, 4 degrees C) for at least one month (ideally, 2-3 months) following pupation: this refrigeration period mimics the cool periods that the beetles experience in the wild. Adult longevity: Typically 3-6 months. The rare adult will live up to a year plus. The rearing of Hercules beetles and related insects has become a popular hobby over the last few years, and there are several rearing-resources available on-line and in print. By Jonathan T. Lai. An extensive breeding guide, with many pictures.